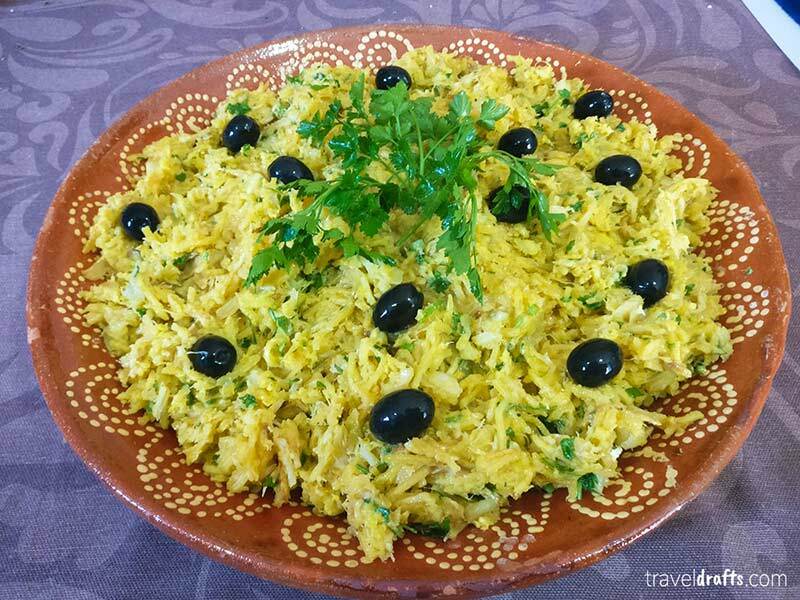 Bacalhau à Brás is one of Portugal’s traditional dishes and it’s adored through the country. Portuguese love Bacalhau (dried cod), and it is one of the most frequently eaten dishes in Portuguese households. Any dish that has cod can be considered Portugal’s National dish. We have the 3rd highest fish consumption per capita in Europe, mostly due to codfish. And the food in Portugal is simply incredible. Ironically codfish isn’t fished in the coast of Portugal, it is fished far from Portugal in the North Atlantic in the Norway sea and near Newfoundland. But we used cod abundantly during our history due to the fact that cod is a good fish to dry and preserve for years. Portugal has a long history of navigators that cruised the sea discovering new routes and places. This required food that lasted for a long time without spoiling and the solution was cod. As you can see cod belongs to our History, it’s even said that we have 365 recipes of cod, one for each day of a year. Be aware that in Portugal we only eat salted dried cod, you won’t be able to find fresh cod. As it is salted cod, to cook it, you need to immerse it in water for 2 days, changing regularly the water. If you don’t do this, the cod would be too salty, no one would be able to eat it. 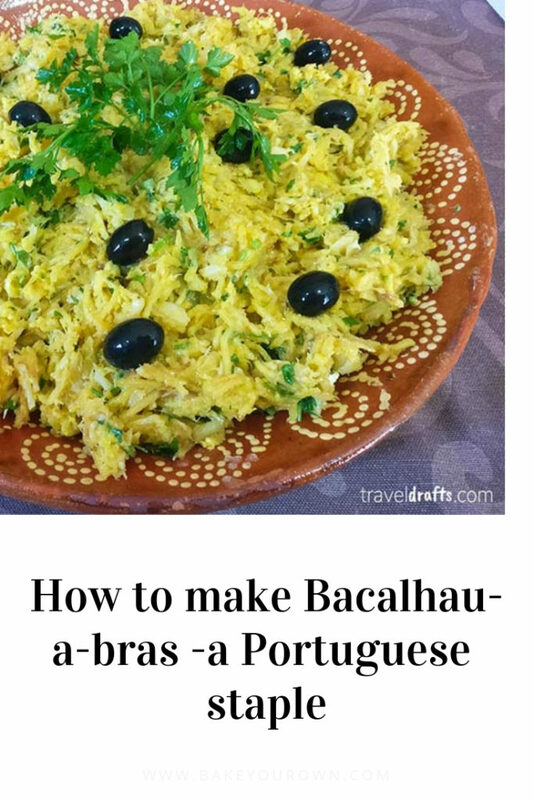 Bacalhau à Brás is an easy cod recipe and one that you will find it in many Portuguese restaurants while visiting Portugal. This dish was created in Lisbon, in Bairro Alto, and has the name of its creator. 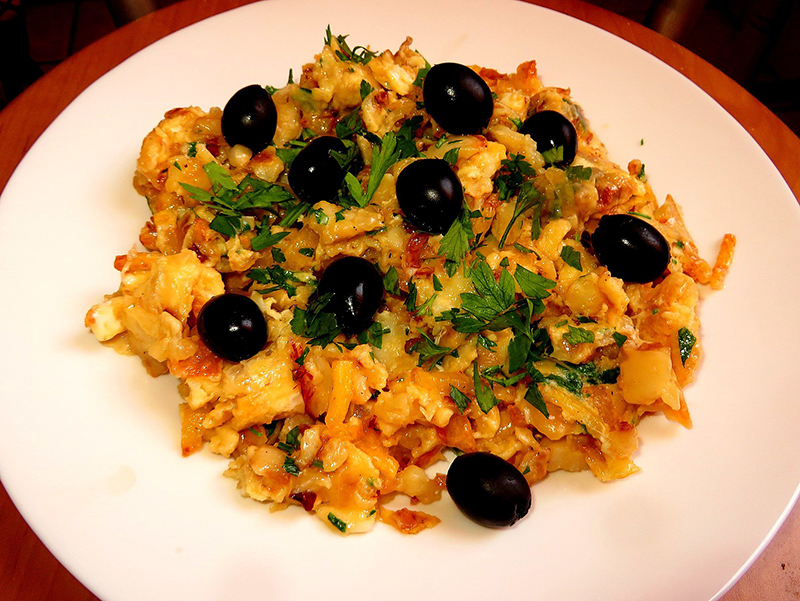 Bacalhau à Brás is made with shreds of cod, thin fried potatoes, and onions, all combined mixed eggs. Olives and parsley added in the end. It is so good that you will want to eat it every week. Depending on the size of the cod you will need to immerse it in water, for 400g of cod 24 hours will do the job, the water must be changed at least 3 times. When the cod is unsalted drain it removing all the water and shred the cod removing all the fish bones and the skin. Cut the potatoes in small matchsticks and deep fry them until golden and crispy, you want the chips very crispy, 7 to 10 min. When done let the chips rest on a paper towel to soak the oil. Whisk the eggs and season with salt and pepper. Join the eggs to the potatoes and cod and combine the mixture in low heat. Before the eggs start to solidify take them off the heat, you don’t want scrambled eggs. Garnish with a handful of parsley and black olives. 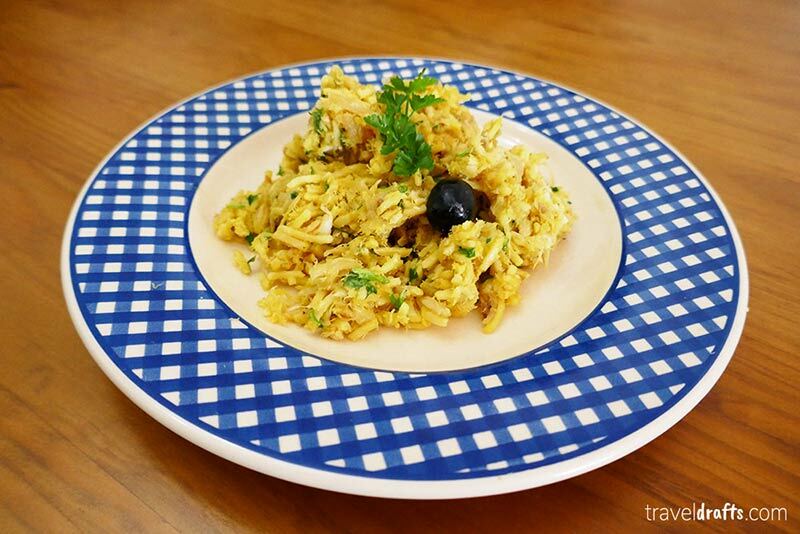 Bacalhau à Brás is a signature dish from Portugal, it is one of those dishes that every Portuguese family cooks and eats regularly as it is so delicious and easy to do. Give it a try, you won’t regret it!